2011 has been a year of unprecedented political tumult in Morocco. As neighboring North African regimes collapsed under the weight of popular pressure, demonstrators have convened in Moroccan cities as well, naming their uprising after the day of their largest initial gathering, February 20, and calling for greater democracy. Theirs has been a “quiet revolution,” according to Nadia Yassine, spokeswoman for the banned Islamist Justice and Charity movement,  for King Mohamed VI has seemed to hasten to meet citizens’ demands. The international media hails the king as a broadly popular visionary engaging in proactive political reform to avoid the fate of Egyptian and Tunisian dictators. In the eyes of the Moroccan government and mainstream political parties, the country has seen a “Copernican revolution”  led by a wise potentate, a “watershed event in the process of completing the construction of a state based on the rule of law and democratic institutions.” The king used the latter phrase in his June 17 presentation of a radically revised constitution that was subsequently overwhelmingly approved in a July 1 referendum. If, as per ancient Ptolemaic astronomy, the sun of Morocco’s people has long revolved around an earthly monarch, Morocco’s rulers would like everyone to believe that henceforth the country’s political order will be heliocentric. But for the February 20 movement, the revolution is still to come. The protesters regard the new constitution as a half-measure, heavy on inclusive rhetoric and light on actual reform. The events of spring and early summer have not quieted them, but galvanized them to push for more. The February 20 movement draws heavily upon a youthful population that had long given up on the political process and unifies a diverse opposition whose interests rarely align. The rebirth of politics in the shape of this movement calls into question the monarchy’s long-standing ability to manage the country through patronage and the king’s symbolic position as “commander of the faithful.” And it may fundamentally challenge what is in fact at the heart of the constitutional reform: a thinly veiled effort to make Morocco transparent for global investment, welcoming to the wealthy diaspora and secure for international tourism. King Mohamed VI took the throne in 1999 with a promise to “turn the page” on the worst abuses of the past, but there are few signs of him ceding power to elected officials or seeking to enshrine civil liberties and rule of law. For all the political prisoners released over the years since his accession, activists and journalists are still regularly arrested and convicted of “threatening state security” or stepping over one or another “red line.” The chief “red lines” forbid questioning the integrity of the monarchy, Islam or the “national territory,” a reference to Morocco’s claim upon Western Sahara. In October 2010, the Ministry of Communications banned Al Jazeera from broadcasting in Morocco for its “irresponsible journalism” on the question of Western Sahara, only reinstating the channel’s license after the July 1 referendum. As late as April 26, Rachid Nini, populist editor of the al-Masa’ daily newspaper, was arrested and then sentenced to a year in prison for writing of the existence of a secret military base where detainees were tortured. Police routinely crack down with violence on technically illegal demonstrations by Islamists, Berberists, human rights activists or those without food, jobs or housing. 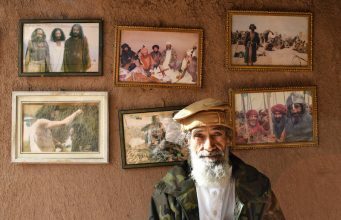 Morocco has been an active participant in the US-led war on terror, dismantling Islamist associations and accepting “rendered” suspects for interrogation and possibly torture, though it was an early signatory of the UN Convention Against Torture. The kingdom has also been a proxy defender of Fortress Europe, deporting African transmigrants by the thousands, though it endorsed the UN Convention in Relation to the Status of Refugees. As the public sector has been progressively sold off to private interests, more and more of the nation’s wealth is in the hands of the royal family and other elites, with the king’s personal holdings estimated at $2.5 billion. In the latest Democracy Index released by the Economist Intelligence Unit, Morocco placed number 116 of 167 countries judged for the fairness of the electoral process, civil liberties, government functioning, political participation and political culture. Indeed, Moroccans regularly accuse parliamentary deputies and senior civil servants of being makhzenisés, men and women who act in the interest of the state, or themselves, rather than the populace they are supposed to represent and serve. It came as scant surprise that the 2007 legislative elections garnered the participation of only 37 percent of eligible voters. The greatly amended constitution approved on July 1 takes only modest steps to open the political system. The representation of opposition parties in government commissions and their access to public financing for electoral campaigns is specified and expanded (Articles 10 and 11), as is the right of civil associations and NGOs (Article 12) and even of private citizens to bring forward bills (Article 14) and petitions (Article 15). But, as critics rightly point out, the king’s executive powers remain unchecked. The king will continue to name the prime minister and approve the cabinet over which he presides (Articles 47 and 48); command the military (Article 53); chair the various high councils on religion, security and the judiciary (Articles 41, 54, 56); name ambassadors (Article 55); approve the nomination of judges (Article 57); pronounce all enacted laws (Article 50); and “at His initiative” dismiss ministers and dissolve the parliament (Articles 47 and 51). The derided Article 19 of the previous constitutions, which spelled out the king’s spiritual and temporal authorities and derived the latter from the former, is now split into two separate articles (41 and 42). One recognizes the king as the “commander of the faithful” who “ensures respect for Islam” and guarantees “the free exercise of religion,” while the other names him as Morocco’s “chief of state, supreme representative, symbol of the unity of the nation, guarantor of the durability and continuity of the state.” The two types of authority are thus delinked, but the king’s person remains inviolable (Article 46) and those who call his rule into question are thus subject to prosecution. The new constitution hardly unseats Ptolemy, let alone enthrones Copernicus, and indeed prescribes punishment for those who would espouse Copernican belief. Moreover, critics have challenged the very process of constitutional reform and referendum as opaque and insincere. From its first mass demonstrations, the February 20 movement had called for constitutional reform by a democratically elected assembly. The king responded on March 9 by appointing a Consultative Commission for the Revision of the Constitution chaired by the constitutional law professor Abdellatif Mennouni and consisting of 19 other members handpicked by the king and his advisers. Over its three months of deliberations, the Mennouni commission met with a number of political parties, trade unions and NGOs. It invited representatives of the February 20 movement and other protest groups, who declined because the process was not public. The king further revised the draft constitution and then submitted it to the country for approval only two weeks before the referendum. While proportionate airtime was promised to all parties, critics accuse the campaign process of strongly privileging the “yes” vote. They charge the king with violating his non-partisan status by delivering a speech for the constitution’s approval and citing a passage from the Qur’an enjoining the public to follow his “way.” The Ministry of Religious Affairs apparently instructed imams to urge a “yes” vote during their Friday sermons. All political parties — including the opposition Islamist Justice and Development Party, which had initial concerns about the role of Islam in the new charter — signed on to the reforms and encouraged their constituents to do the same, with the exception of four minor far left parties who collectively hold only 22 of the 325 seats in the Chamber of Representatives (the part of Parliament that is directly elected). On several occasions, the February 20 movement rallied over 100,000 people across the country in a call to boycott the referendum, but these demonstrations were harried by police and confronted with violent counter-rallies by supporters of the referendum who branded the protesters as anti-monarchists. Protesters said the “monarchists” were akin to Egypt’s baltagiyya, “thugs” organized and paid by the Ministry of Interior. The dissenters similarly contest the referendum results. They documented incidents of voters being bussed to polling stations by local officials, stations not carrying “no” vote slips and electoral officials not verifying identification or requiring voter signatures. Moroccan residents abroad, whose votes were strongly solicited by the government, reportedly had even looser identification requirements and in some cases voted in mosques under the watchful eyes of the consular officials on whom they rely for administrative services. Protesters do not dispute the 98.5 percent approval result, blaming it on a poor, under-educated and intimidated electorate blindly following their political and religious leaders. But they do question the 72.65 percent turnout claimed by the interior minister, as earlier Ministry statements, media polls and anecdotal reports had put the figure at no more than 50 or 60 percent. Only 13 million of a potential electorate of at least 22 million, they further note, had registered to vote in the first place. Even at 72.65 percent, the turnout would be lower than in any previous constitutional referendum, with the exception of a minor change to the financial regulatory mechanism that occurred in 1995. Whether this plebiscite provides the monarch with a popular mandate remains to be seen. But it would be a mistake to dismiss the referendum as yet another rubber stamp on the monarchy’s writ. If not revolutionary, the constitutional revisions are certainly radical. In the previous ten referendums, all under the reign of Hassan II, the revisions had been superficial: vacillating between a bicameral and unicameral parliament, slightly expanding the role of the prime minister, including some minimal language on human rights and citizenship, adding a budgetary audit court and reducing the king’s age of majority to 16 (which has since been returned to 18). These changes were all initiated from the top, and none responded to widespread popular protest. The current constitution, by contrast, has expanded from 108 to 180 articles, and very few of the older articles have remained unchanged. In many cases, the new articles respond directly to demands from civic associations and overall the constitution’s rhetoric appears lifted directly from the slogans and communiqués of the protesters. The seven-paragraph, nine-bullet point preamble defines Morocco as a “modern” state of “democratic rights” founded on the “principles of participation, pluralism and good governance.” It summons forth an “interdependent (solidaire) society where all enjoy security, liberty, equality of opportunity, respect, dignity and social justice.” Note that such language of modern, democratic rights precedes the stipulation that the Kingdom of Morocco is an “Islamic sovereign state” — the first line of all previous constitutions. Further, the 2011 document contains a new, 22-article section entitled “Liberties and Fundamental Rights” in which freedoms of information (Article 27) and of the press (Article 28) are added, as are the rights to housing, health care, welfare, water, a clean environment and durable development (Article 31), and the rights of women, children and the disabled (Articles 32, 34). Such protections appear alongside prohibitions of sexism (Article 21), torture (Article 22), racism (Article 23) and corruption (Article 36). These “liberties and fundamental rights” remain sacrosanct even if the king declares a state of emergency (Article 59) and cannot be retracted by future constitutional revision (Article 175). While the fully independent judiciary demanded by demonstrators is declared if not precisely guaranteed (insofar as the king continues to control the appointment of judges), the new constitution adds 17 new articles to the relevant section that safeguard the presumption of innocence, habeas corpus and the rights to fair, public and speedy trial, due process, state-provided counsel and appeal. These clauses similarly put explicit checks on judges’ partiality, excess or the outside influence on the judicial process. Finally, a new, 18-article section on “good governance” offers further guarantees against the corruption or non-compliance of civil servants; establishes a National Council on Human Rights;  and provides for a national ombudsman to represent the complaints of citizens regarding the public administration. While some of these provisions invoke laws yet to be written, they are undeniably substantial and perfectly consonant with the February 20 movement and its various allies’ call for an accessible, democratic regime of dignity, respect and social justice. The provisions targeting Moroccan youth are particularly striking. Of Morocco’s 33 million citizens, 65 percent are estimated to be under 30 years of age. Young men and women are marrying later and later as difficulties in procuring steady employment and housing increase. If national unemployment figures hover around 10 percent, they reach as high as 26 percent for youth in the 25-34 age range, and close to double that in urban areas. Ironically, the more educated Moroccans are, the more likely they are to be jobless. Over the last decade, unemployed university graduates (les diplomés chômeurs) have staged weekly demonstrations in front of Parliament calling for an open job market that does not simply benefit those with family connections. The graduates’ organizational structure, non-violent tactics and militant experience laid the groundwork for the February 20 movement. The latter — whose membership and leadership consists primarily of young men and women — demands state reinvestment in the public sector, specifically the “integration of unemployed university graduates into the civil service by transparent and fair competition.” The new constitution seeks to address these demands by envisioning the creation of a Consultative Council on Youth and Associative Action that would boost the participation of young men and women in the economic, cultural and political life of the country (Article 33). While stopping well short of expanding public-sector employment, it does prescribe state investment in the arts, scientific research and sports (Article 26) that would ostensibly encourage younger talent to remain in the country rather than seeking professional opportunities abroad. As important, the new constitution redefines Morocco as a culturally and linguistically plural state. The February 20 movement had joined the variegated Berber (Amazigh) movement that for the last three decades had been calling for the recognition of the Berber language (Tamazight) as an official language of Morocco on par with Arabic. Mass demonstrations for change that have occurred since February have consistently included militants carrying Amazigh flags and banners written in Tamazight. Previous constitutions had inscribed the official status of Arabic in the first line of the preamble. No such mention of language is made in the new preamble. Article 5 specifies that “Arabic remains the official language of the state,” yet further stipulates that Tamazight “constitutes an official language of the state, as the common heritage of all Moroccans without exception.” Some Amazigh activists continue to worry that the distinction between the definite and indefinite articles will perpetuate Tamazight’s secondary status. And they remain skeptical over the effectiveness of the future law that will regulate the Berber tongue’s introduction into the education and media systems. But the change does put Morocco ahead of its North African neighbors in respect for indigenous rights. Moreover, the 2011 constitution does not delimit Morocco’s diversity to an Arab-Berber divide, but rather portrays the country as a veritable cultural and geographic crossroads. Just as Amazigh culture is declared to be the patrimony of all citizens, so too is its broader ethno-cultural diversity declared to constitute its “national identity, one and indivisible.” The preamble specifies a “convergence” of Arabo-Islamic, Amazigh and Saharan “components” that is “nourished and enriched by its African, Andalusian, Hebrew and Mediterranean influences.” If the first two lines of the previous preamble drew from the language of decolonization and Third World solidarity to specify Morocco’s place in a “great Arab Maghrib” and “African unity,” the new introductory stanza invokes a broader globalism that juxtaposes a future North African union alongside an Arabo-Islamic umma, African solidarity and Euro-Mediterranean partnership. Arguably, these gestures are purely rhetorical, but the contrast with prior official identity statements is remarkable. Finally, if previous constitutional revisions centralized power in the hands of the Rabat political elite, limiting rural administrators to simply enforcing “the law,” the new charter allows for significantly more territorial pluralism. The first article defining Morocco as a “constitutional, democratic, parliamentary and social monarchy” also describes its territorial organization as “decentralized, based on an advanced regionalization.” Over the last five years, nascent autonomy movements have sprung up in the far northern and southern, largely Berber-speaking peripheries — areas that felt themselves to be economically underdeveloped and marginalized by the central government. The peripheries have demanded more administrative self-determination and greater freedom to define their own development initiatives. The 2011 constitution addresses these demands with seven new articles proposing state efforts to foster local citizenship and human development across the regions (Articles 136, 139). It outlines a limited degree of local financial independence while assuring an “equitable allocation of resources, in order to reduce disparities between regions” (Articles 141 and 142). And yet, to evaluate the new constitution on the sole grounds of its ability to contain domestic dissent would be shortsighted. Certainly the timing of the reforms was a defensive move by the king to defuse a burgeoning mass opposition in the wake of the examples of revolt in Tunisia and Egypt. And a number of the revisions did directly address particular grievances by militant social movements. But the Moroccan public was arguably but one of several audiences for whom the new constitution was written. In many places, the document reads less as a model for government than as a mission statement crafted for the international diplomatic and business community. The preamble’s definition of Morocco as a modern, democratic state two paragraphs before its description as an “Islamic sovereign state” plays to a global discourse premised on “clash of civilizations” rhetoric. The new section on “Liberties and Fundamental Rights” is modeled on similar bills of rights in the US and French constitutions. Assurances of transparency, good governance and civil liberties are vital for the procurement of development monies from international agencies that increasingly have democratization riders attached. Development euros are not the only ones at stake. Morocco depends on foreign investment (particularly from Europe and the Gulf) both to keep state enterprises — privatized since the late 1980s — afloat and to provide the infrastructure for its largest revenue source: tourism. Many of these monies have dried up amidst regional unrest, with the Abu Dhabi-financed Bou Regreg tourist complex standing half-finished, for instance. Attracting the funds back is of the highest priority. Assuring the country’s “tranquility, unity, stability” — to quote the closing lines of the king’s June 17 speech — counters the anxieties of both tourists themselves and the investors who make their stay luxurious. Moreover, among the civil liberties ensured in the new constitution are property rights, free competition and free enterprise (Article 35). Together with new legislation against corruption and proposed contract transparency laws, the revised charter makes for good neoliberal marketing strategy. Small wonder, then, that the protesters’ demands for expansion of the public sector have largely gone unheeded. Second to tourism in Morocco’s revenue sources are remittances from emigrants. For years, the state has expanded its efforts to suture the connection between the diaspora and the homeland, welcoming Moroccans home on holiday and channeling their remittance monies through national banks and into domestic enterprises. In 2007, the state created a Ministry of the Moroccan Community Abroad to strengthen these ties, reaching out particularly to emigrant investors. With the Mohamed V Foundation for Solidarity, it has expanded the infrastructure for holiday visits, establishing welcome stations at ferry and airport terminals, as well as overseas in southern Europe, under the moniker of Operation Marhaba 2011. The new constitution similarly seeks to ensure emigrants’ political rights in both Morocco and their countries of residence, guaranteeing their rights to elect and be elected to public office and promising to “reinforce their contribution to the development of their homeland (patrie)” (Articles 16-18). It further inscribes into law the Council of the Moroccan Community Abroad, consisting largely of politicians, social activists and intellectuals elected by Moroccans overseas to represent their interests in Morocco and advise the Ministry on its various programs (Article 163). Such institutions explicitly aim to shore up cultural, economic and political bridges across the Mediterranean, and thus bolster Morocco’s role as a modern player in a world of global competition. Such neoliberal globalization requires the heavy hand of the state not only to deepen the channels through which people and money flow, but also to secure such ties from internal and external threats. 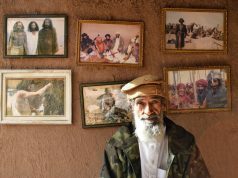 The Moroccan state has worked hard to shed its reputation as a breeding ground for terrorists, especially in light of the April 28 bombing of the Argana tourist café in Marrakesh. Moroccan security forces have deployed to break up Islamist networks, in certain cases the very same ones they helped to foster in previous decades to combat indigenous Marxist revolutionary movements. The new constitution establishes a High Security Council, presided over by the king, with the charge of devising strategies for “internal and external security” and managing crises. In the preamble, security is placed at the head of the list of basic rights that otherwise include liberty, equality, respect, dignity and social justice. The order is by no means arbitrary. References to internal and external security imply more than a domestic terrorist threat. In the constitution, security is consistently paired with “national unity” and “territorial integrity.” The implied challenges to these fundamental criteria are potentially varied, but the most germane reference is to the disputed status of Western Sahara — what the king, in his June 17 speech, referred to as “our beloved Saharan provinces.” Since Morocco asserted dominion over the former Spanish colony in 1975, it has devoted substantial resources to integrating the territory into the national fold. Moroccan soldiers continue to man the separation barrier between the Moroccan- and POLISARIO-controlled regions alongside UN peacekeepers in place since 1991. The western port cities of Dakhla and Laayoune have received heavy state funding for urban development, and residents benefit from educational stipends, housing subsidies and retirement pensions that exceed those of other Moroccan citizens and sometimes incur resentment. The preamble’s discussion of “Saharan” culture as a component of Morocco’s “unity,” and Sahara’s later mention as an “integral part of the Moroccan unified cultural identity” (Article 5), expand such efforts at socio-economic integration to the realms of language, culture and politics. Indeed, the king urged his subjects to approve the new constitution because it would “provide a strong impetus for the final settlement of the just cause of the Moroccan Sahara.” The constitutional referendum thus leaves little room for any future referendum on Saharan independence, as envisioned by UN resolutions. The new Morocco projected by the constitutional reforms is thus a strong, “modern” monarchy of diverse subject-citizens free and equipped to compete in the global marketplace. Domestic contestation would be defanged by mechanisms of “good governance” that would manage dissent and provide equity of opportunity, if not equality of outcome. Freedoms and civil liberties would be guaranteed to the extent that they do not challenge the “territorial integrity” or “national unity” of the country or dispute the centrality of the king or Islam. Increased security and the rule of law would ensure a safe environment where such free citizens could equally enjoy their fundamental rights to live and labor. It is a neoliberal utopian space where politics is either illegitimate or simply unnecessary. Utility maximizes for the wealth of the nation and its individual subjects. Indeed, the constitutional referendum seems to have only enlivened the political contention that has simmered in Morocco for many decades. If previously relegated to university campuses where it was taken as a passing stage of adolescence, or marginalized in semi-clandestine Islamist or Berberist networks infinitely factionalized and in a constant dance of cooptation by the makhzen, politics has now literally returned to the streets. The February 20 movement built upon the networks previously associated with the human rights, trade union, diplomés chômeurs and Amazigh circles, conjoining them into a single umbrella movement that transcended (or at least momentarily sidelined) extant ideological differences. It actively shared experiences with and learned tactics from other international youth associated with a history of protests in Serbia, Egypt, Tunisia and elsewhere. It used Facebook, Twitter, YouTube, blogs, GIS software and a wealth of online news sources to connect militants across the country, turning every activist into an independent journalist recording and reporting on her local experiences. 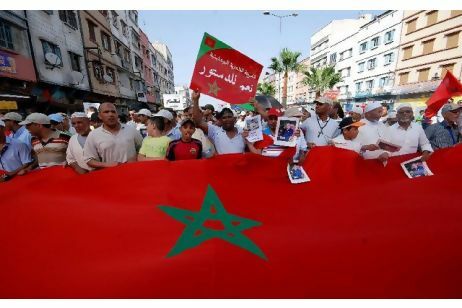 On a repeated basis since February, the movement succeeded in mobilizing over 100,000 demonstrators across Morocco. While the protests did not concentrate in a single space like Cairo’s Tahrir Square, their strength arguably derived from their geographical spread to provincial towns in the countryside and the peripheral working-class neighborhoods of Rabat and Casablanca. Few could claim that the unrest was simply happening elsewhere.